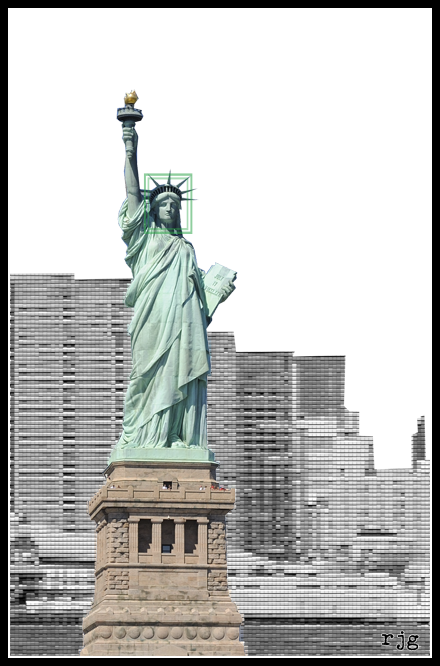 The Statue of Liberty is getting a facelift, though the changes aren’t only cosmetic. An upgraded "state of the art" security system will help keep Lady Liberty safe when it reopens soon. But what does the system entail, and could it involve a controversial new face-recognition technology that can detect visitors’ ethnicity from a distance? I tried to find out — and a New York surveillance company tried to stop me. Face recognition was first implemented at the Statue of Liberty in 2002 as part of an attempt to spot suspected terrorists whose mug shots were stored on a federal database. At the time, the initiative was lambasted by the American Civil Liberties Union, which said it was so ineffective that “Osama Bin Laden himself” could easily dodge it. When it came to my questions about face recognition, though, things started to get murky. Was that particular project back on track? “We do work with Cognitec, but right now because of what happened with Sandy it put a lot of different pilots that we are doing on hold,” Peter Millius, Total Recall’s director of business development, said in a phone call. “It’s still months away, and the facial recognition right now is not going to be part of this phase.” Then, he put me on hold and came back a few minutes later with a different position — insisting that the face-recognition project had in fact been “vetoed” by the Park Police and adding that I was “not authorized” to write about it. Linda Friar, a National Park Service spokeswoman, confirmed that the procurement process for security screening equipment is ongoing, but she refused to comment on whether the camera surveillance system inside the statue was being upgraded on the grounds that it was “sensitive information.” So will there be a trial of new face-recognition software — or did the Park Police “cancel” or “veto” this? It would probably be easier to squeeze blood from a stone than to obtain answers to those questions. “I’m not going to show my hand as far as what security technologies we have,” Greg Norman, Park Police captain at Liberty Island, said in a brief phone interview. The great irony here, of course, is that this is a story about a statue that stands to represent freedom and democracy in the modern world. Yet at the heart of it are corporations issuing crude threats in an attempt to stifle legitimate journalism — and by extension dictate what citizens can and cannot know about the potential use of contentious surveillance tools used to monitor them as they visit that very statue. Whether Cognitec's ethnicity-detecting face recognition software will eventually be implemented at Lady Liberty remains to be seen. What is certain, however, is that the attempt to silence reporting on the mere prospect of it is part of an alarming wider trend to curtail discussion about new security technologies that are (re)shaping society. This article first appeared at Slate.